my pointless: horrible criminal sketch leads to arrest. Earlier this year, a Bolivian taxi driver named Rafael Vargus was brutally murdered. The police didn't have many leads, so they asked for public help. There is simply no way a criminal could be apprehended by looking at that drawing. You'd think. As horrible as the drawing is, it has led to the arrest of a suspect in the murder. Bolivian television is not allowed to show the faces of murder suspects. 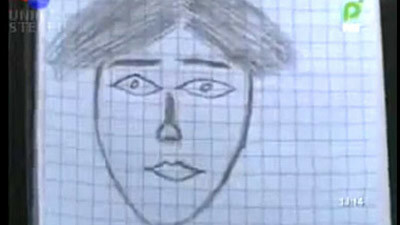 So, in news report, the suspect's face is hidden by this drawing.